See DOG PEARLS for background on these films. 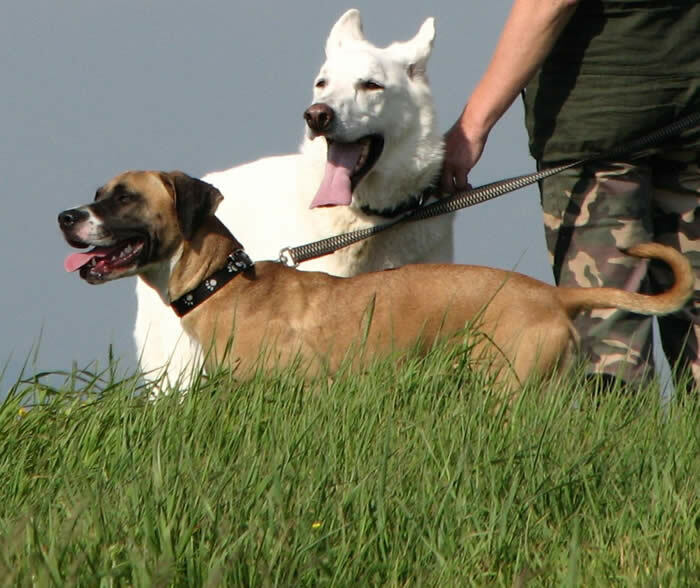 Also, check out DO(G)NATIONS and see how you and YOUR dog(s) can JOIN OUR PACK! I’m a Spirit Dog now, but I’m the one who started this whole Dog Pearls thing. 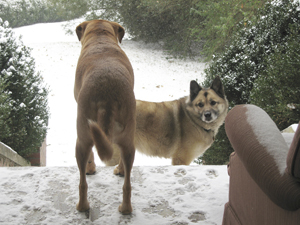 I left for Dog Heaven on March 12, 2008, not long before my 14th birthday. My leaving was with so much grace, depth and peace that it really affected my family. Then Mom had a vision of me that became the first two Dog Pearls. You won’t see me, but I’m in there anyway, running and bouncing on the mountain! I was a pretty mix of black lab and some kind of spaniel. I had already been in four “homes” by the time I was eight months old, and I did NOT like to be confined. My family met me on a cold, rainy night, and they couldn’t forget my gentle lick and cute face. They were looking for a dog after their first Golden Retriever Rainbow died. They had already heard about Eli, a fancy breeder’s shy young Golden. They adopted Eli first, but they couldn’t stop thinking about me. 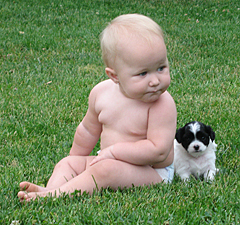 Eli and I were buddies from the instant we met, but I was always the alpha dog, even though I was younger and smaller. I taught Eli how to overcome his fears and have more fun. Then Mitch found us soon after I turned two. We three dogs and the three cats all got along great. Eli became a Spirit Dog about four years before I did. He’s here with me now, along with lots of other family and friends. Because I’m an alpha soul, I’m still actively involved with my family. Boy, do they ever need my guiding paw! Story by Katie & Linda McLean. Photos by Jim Stokoe. I’m originally from another planet, but I’m supposed to keep that a secret, okay? 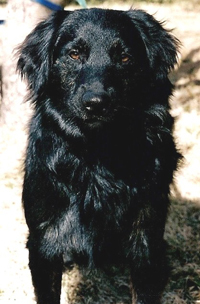 I was 12½ years old when they filmed me and am probably collie mixed with English setter or Borzoi. I was about eight months old when I found my mom Linda and dad Jim walking Katie and Eli. I walked home with them and went straight up to their door, ready to move in. They looked hard for who lost me. I wasn’t house trained, but I was unusually pretty and so funny, they were sure someone was looking for me. By the end of three weeks, I was already part of their family, and it was too late to turn back. Katie was my best friend in the whole world, and it was hard for me to let her go. She’s still trying to boss me, even though we’re both in Dog Heaven now… it’s kinda nice, actually. She helped me fall in love with our new puppy Gracie, pesky as she was… Gracie made me feel young again… like a new “leash” on life! Story by Mitch & Linda McLean. Photos by Jim Stokoe. 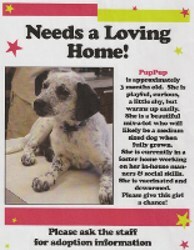 I’m a “beautiful mix-a-lot” – blue heeler, Dalmatian, Catahoula – or maybe even CUTEahoula? I was a three-month old “porch puppy” when I got hurt. My people abandoned me at the emergency clinic – I guess it cost too much money to fix me. A really nice vet named Laura Chadwick took care of me and then fostered me. The day after Katie died, Mommy and Mitch went to the vet’s to thank Dr. Amy Plankenhorn for helping Katie get to Dog Heaven. Daddy wasn’t ready for another dog yet, but Amy pulled out this cool flier. It was a picture of ME, and Mommy fell in love. Daddy fell in love, too, when he saw it later at home. They met me with Mitch the next day and brought me home a week later when all my stitches were healed. 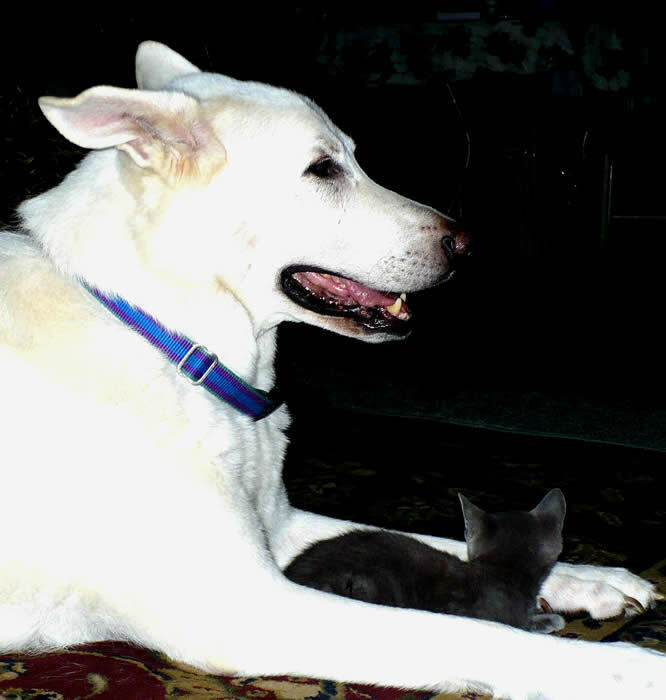 Mitch was my best buddy in the whole world, though I love my new little brother Joey, too. Story by Gracie & Linda McLean. Photos by Jim Stokoe. I am also a Spirit Dog now. 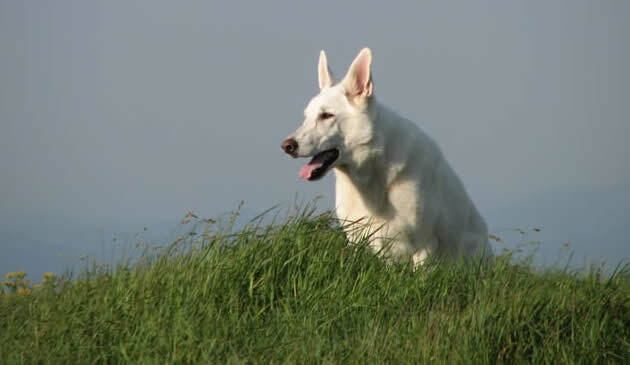 I was a beautiful white German Shepherd who came into the lives of Mitch’s family when my mom Dana offered me as support during Katie’s illness. She felt I really needed to be of service. Though I was 105 pounds and a very large presence, I managed to make Mitch and all the other animals comfortable the very first time I visited them. Mitch’s mom Linda was touched by my profoundly calm, mystical energy. After Katie died, though Linda had just envisioned Mitch taking Katie’s place in the first Pearl, she kept seeing me running that ridgeline, too. What no one else knew is that I was already ill when we met, and I died May 8, 2008, not long after Katie died. My sister and mate Sophia, who lived far away, also died about the same time. I WAS meant to run that ridgeline, and my Spirit will be a big part of the energy of the first Dog Pearls. Story by Oz, Dana Gatlin & Linda McLean. Photo by Dana Gatlin. When they filmed me on the mountain, I was a 9 year old white German Shepherd who had just lost both my parents, Aslan and Sophia. I had not been as gentle and calm as my dad, but everyone said I seemed to take on his energy at a Little Pearls event just two days after he died. I proudly stood in for my dad on that mountaintop “shoot” and it was really, really fun to run free with my little Lucy and the other dogs. But I really wasn’t feeling well. In November 2008, I became a Spirit Dog, too, surrounded by my human, canine and parrot family, at our new home in Tampa, Florida, with help from Dr. Steve La Due. They made Spirit Dog just for me. Story by Tucker, Dana Gatlin & Linda McLean. Photos by Jim Stokoe & Pamela Stringer. I was a 1 ½ year old Boxer mix when I became a Dog Star. My mom found me as a puppy, running around loose in the streets. I’m funny and full of energy, and I can bounce like a rabbit! 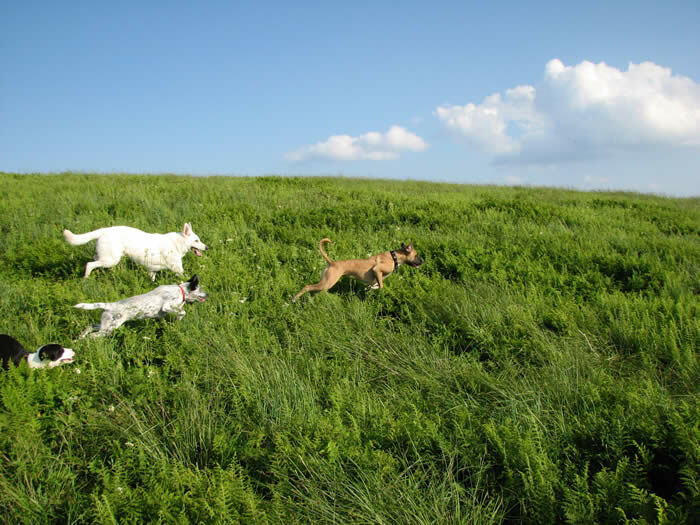 I’m the pup in the lead with Lola, Gracie and Tucker in the photo below. Story by Lucy, Dana Gatlin & Linda McLean. Photos by Pamela Stringer. My name is Lola. I was 5 months old that day on the mountain, but don’t I look mature? I think I’m a lab and pit bull mix. My mom adopted me from a friend of hers whose rescue dogs unexpectedly had puppies. Despite my chewing tendencies, I’m so much fun to be around. I love a good snuggle, long walks and fetch sessions. I’m a little shy when other dogs aren’t around, but let me loose in the dog park and I go nuts! Story by Lola & Pamela Stringer. Photo by Pamela Stringer. 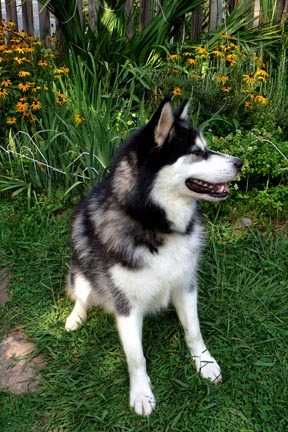 I’m a Malamute rescue. Life was all fur, milk and squeals, and then He came and named me Shadow. Everything changed. Suddenly I was alone and it was colder. And I guess I was free: free to forage for food in suet feeders and fishponds; free to run after the big dogs who made sure I knew I was the smallest, weakest one; free to scrounge for enough to eat and a place to sleep. Best of all, free to make friends with Emma, the dog next door, and the person she lives with, who saved me. 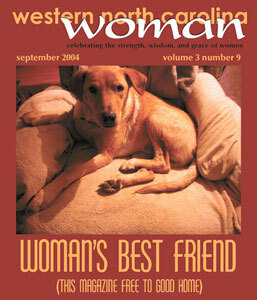 When He decided I was too much trouble and needed to go away, Emma’s mom contacted the Humane Society where I lived. She asked them to contact Alaskan Malamute Rescue, to find me a good home with someone who would understand me, my wildness and my need to talk. Now I can wooooo woooo as much as I want. I have my own house and my own door into the backyard. I can hunt at night if I feel like it, but I don’t have to eat possum anymore. I have a regular meal at least twice a day, and a super-sized dog biscuit at night. Then I go to the dog bed in my mom’s room. Of course there are rugs, toys and bones all over the house… and cookies from Warren Riggle ‘cuz I’m GOOD when I go to the vet’s… and my mom sets up play dates with other dogs like Twiggy… I LOVE it! Story by Wiley & Darlyne Sahara. Photo by Sabrina Kumar. I’m a standard poodle, sometimes called Twigs. I’m an only dog and live with three cats and Ruthy and Ross Fricke. I enjoy at-home weekly pedicures and monthly haircuts. My life is filled with dog training; play dates, especially with Wiley, my Malamute buddy; and doggy day care twice a week at “You Work, I’ll Play” to keep me stimulated while my people work. Unlike most of the family dogs before me, I am not a rescue. Yet my mom and dad say I rescue them daily when they’re worried, stressed, or sad. My soulful stare, crazy antics and quirky behavior put smiles on their faces. I have never growled or met a dog, cat or person I didn’t want as a friend. If I could get away with drinking out of the toilet bowl, life would be even better! Story by Twiggy & Ruthy Fricke. Photo by Linda McLean. I’m a rescued, neutered male, just like my best buddies Kennedy and Kane. 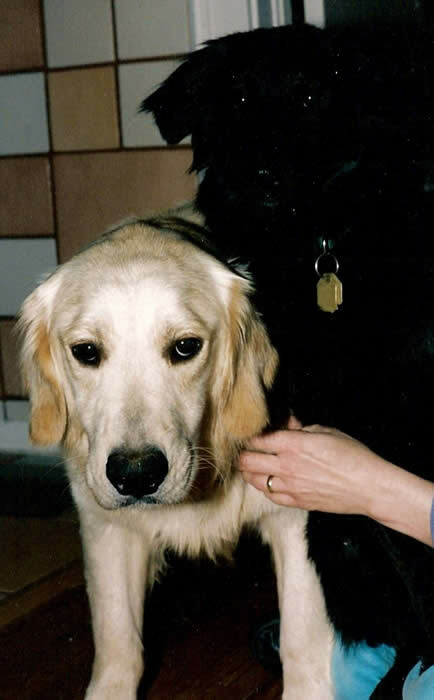 Our mom and grandmom Julia Nooe, who has long been involved in rescues of Golden Retrievers and many other dogs, says she can’t imagine people having only one dog, since we get so much out of being with each other. On most days, we all get a 3 mile walk to keep us healthy. I came first and Mom says I was a heartbreaker: a neglected, feral-like Golden Retriever. No eye contact, no holding, no leash. I came from a kind of puppy mill. I was not a cute, funny, playful dog, so no one adopted me. Someone told Julia about me through Foothills Golden Retriever Rescue. I really needed a lot of help leaning how to trust people, but slowly, I came around. Now I’m a love bug! I am named Boo Radley after a character in To Kill a Mockingbird. I still gets scared easily. I’m prematurely gray – but handsome, too. Julia got my doggie mom Sophie and sister Lily out of the puppy mill and into a good life, too – that makes me happy. I came from a fancy breeder out west, where I was adopted. About seven months into my adoption, my person became allergic to me and took me to a shelter here. The shelter called Julia for Foothills Golden Retriever Rescue. I know I’m really handsome and like to prance around, but I’m not stuck up. I’m just a fun, confident dog who loves to play hard, especially with my brother Kane. I was going to be put out on the street at age 1 – my family just didn’t want me anymore. Julia’s son asked if he could bring me home for fostering, and the rest is history. I am totally deaf and think I was born deaf, but I make up for it with my sharp nose and great eye contact. I have had lots of separation anxiety issues and love always being with my two golden brothers. Grandma Julie says I’m so precious, I make her want to advocate for pit bulls and pit bull mixes. I probably have some bulldog in me, too. I LOVE to play hard with Kennedy and I love people, too! Story by Kane, Julia Nooe & Linda McLean. Photo by Linda McLean. I’m mostly German Shepherd, but might be part Siberian Husky, too. Though I’m middle-aged now, I am still young enough to remember the day that my Dad walked in to the pound. I’d been locked up for about 10 days — they called me Lacey there. Dad had come back because he was thinking about adopting another dog, but he saw me outside. The nice volunteer walking me told him that I was her favorite, and potty trained, too (it was hard to learn, but it really paid off for me that day, though Dad wasn’t sure about leaving the other doggie behind at first). He came in to see the other dog again, but just then, there was a small noise, and the other dog started yapping very loudly. I’ve always been a little quiet and shy, and even now I only bark when a person or animal visits the house. Dad was impressed with me and my training, and I liked him, too, so now we live together. I have a new Mom, too. I get lots of treats and have a really nice house, a Dad who works at home and a yard, so I’m pretty content. I want to be a therapy dog when I grow up, because I like being a social butterfly and it is nice when everyone tells me how pretty I am. Story by Laika & Mark Goldstein. Photo by Alpine Photography. Junior just happened to be at the dog park in Asheville when we met Laika and her dad Mark there. He was one of many dogs that day, playing, digging and interacting. He was SO CUTE and so interested in what we were doing that we asked his person if we could film him, too, and she said yes. We had no idea how important he would become in two sweet Dog Pearls: Dig into the Good Stuff! and Do You Know Who You Are? We would love to find this guy. He would be a young adult now. I hope he is having a happy, really good life! Story by Linda McLean. Footage still from Shane Peters. Many years ago, my mom Wil had an Old English Sheepdog Della, who shared her life for fifteen years. After Della traveled on to the spirit world, Mom had no interest in having another dog EVER. 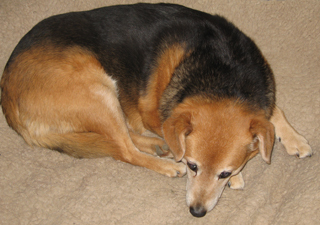 But one night, twelve years later, Della appeared in a dream and said it was OK to get another dog (really!). For two weekends, mom walked through the shelter. It was heart-wrenching, but she felt no connection with any pup. The second weekend, as puppies clambered at the cage doors, she saw a little white dog laying in the back of a cage – me! She says I looked so worried. She thought, “Don’t worry, you’re coming with me.” I stood up and looked at her, thinking “It’s about time….” I’m supposed to be part Jack Russell terrier/part Dalmatian… a good guess, since I’m short and all white with black spots on my ears. I hardly bark and am really laid back. Mom and I have been together since October of 1999, so I’m an older pup. From the beginning, I went to “work” with Mom at a book distributor and became the greeter for all visitors. At the first Mixed Breed Doggie Show, I won first place in the small dog category and Best of Show, too! Everyone says I have a great calming, healing presence. Mom calls me her “Zen dog”. When she had to change jobs, I went to work for awhile on my own as a greeter at the chiropractic and acupuncture office next door. I could always tell who needed me most, and I’m always gentle. Story by Wil ‘n Chai. Photo by Linda McLean. Story by Happy Bea & Debra Roberts. Photos by Linda McLean. Story and photo by Julie Parker. Here I am looking beautiful and that was my bruvver Charley. I miss that silly boy…. Photo and text by Julie Parker. I am a famous dawg too… my daddy used to be David Cohen and I was in lots of his cartoons. You can see more of me at my mommy’s dog website. Here is one of daddy David’s cartoons of me. I died in the Spring of 2010, a very, very old dog with a very good life. I’m still so grateful. I am vewwy vewwy cute. This is one of my people… I used to live down the street from Charley, Anna and Freya. 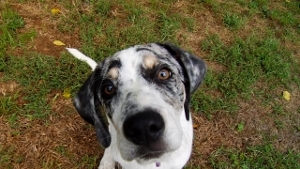 I was a 4 month old Blue Tick Southern Hound dog mix when I became a Dog Star. 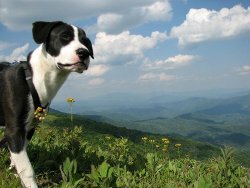 I was dropped off at the Asheville Humane Society when I was just 2 months old and adopted by a family that I really loved. 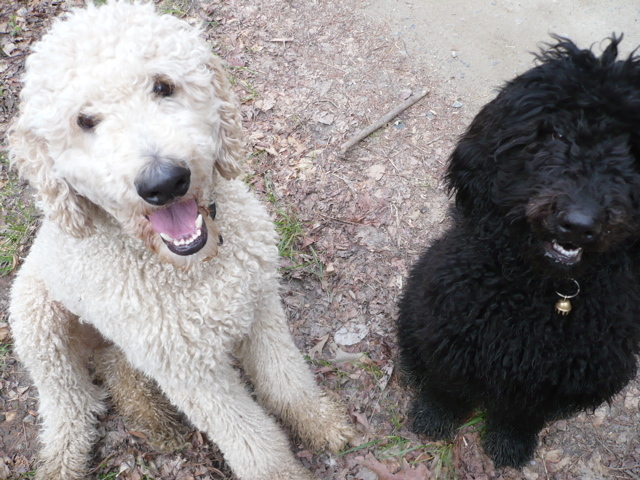 I used to live near Gracie – boy, did we have fun playing! Story by Harley & Linda McLean. Photo by Shane Peters (HD footage still). I am Minnie Mangum, proud companion of the Mangum Family of Weaverville, NC. I was adopted from the Buncombe County shelter in September of 2005. I am mostly a hound dog (treeing walker or foxhound) mixed with Labrador retriever. I have a routine working lifestyle as a shop dog. I am a fixture of Main St. Weaverville and the greeter at Mangum Pottery, the family business. I have a lot of friends who stop and see me every day, some whom I can always count on for treats. A lot of my friends are young kids in strollers. I have a few friends who get me wound up and barking. Some canine friends drive by in cars each day and we bark at each other, too. Sometimes my family takes me for mountain bike rides at Bent Creek (my favorite) or hiking up near Coleman Boundary or on other trails nearby. I am a loyal dog and after a few scary experiences being lost when I was young, I now never roam too far. Story by Minnie, Beth & Rob Mangum. Photo by Marlisa Mills. My name is Maggie. I came from the Furever Friends Animal Rescue Network adoption program at the Superpetz pet store near the Brevard Road Mall. My original name was Minnie because I was so small. My owner had dropped my littermates and me off in a box at the Madison County Shelter. Some concerned lady at the shelter contacted a no kill shelter to help find me a home. By the time Tiffany and David found me, I was 13 weeks old and had some separation issues. They were my fourth home in that short time. 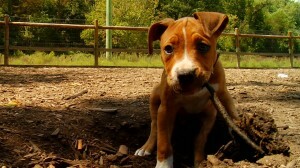 When asked what breed I am, my dad says I am a MadCoPo Pup–short for Madison County Pound Puppy. I am really a Border Collie mix. I’m happy and healthy and have such a good life. I get to walk and run and play every day and better yet, I get to go to work with my people daily. I live with three kitties, all of whom were also rescued by my family. They are my buddies. My favorite thing is to play with my neighbor Bodie–a 130 lb Rottweiler (rescued from Buncombe County Shelter). We love each other and particularly like taking walks together. I can run faster than any dog ever and tend to loop circles around him as he sits and watches me. Life is Good! Story by Maggie, Tiffany Hall & David Graham. Photo by Marlisa Mills. Hi, I’m Floyd and this is my sister Isabelle. I’m tall, blonde and handsome. Isabelle is younger and smaller than I am, but she keeps me on my toes. We are standard poodles and live with our mom and the cats. I had to have three major surgeries before I was 14 months old because I was born without good hips. I couldn’t bear weight on my back legs for several weeks after each surgery and had to walk with a sling under my hips for a long, long time. But it made me very special and now I understand others who might be feeling sick or lonely. I’m beginning my therapy dog training and hopefully, Isabelle will be trained too. But in the meantime, we will always have fun hiking, playing fetch and swim, swim, swim! Story by Floyd, Isabelle & Jill Zimmerman. Photos by Jill Zimmerman. 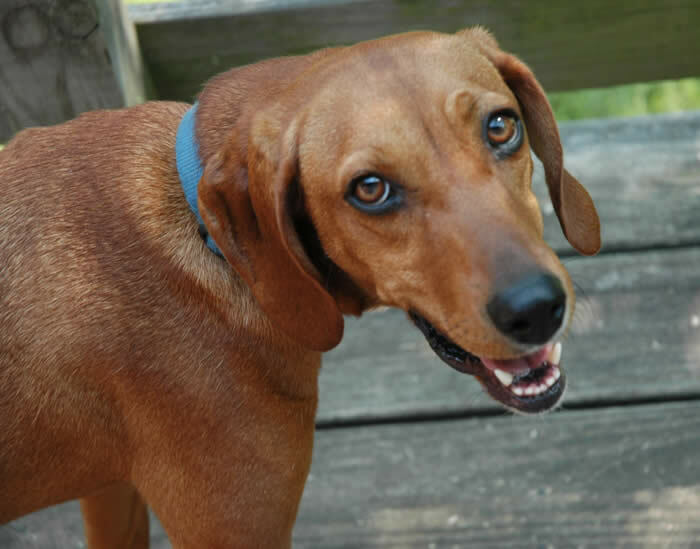 I am a Red Bone Hound. I was dropped off at the B & B at Ponder Cove by the Easter Bunny when I was about 2, or that is what my mom says. I surprised her while she was taking that sleepy walk with her dog Ponder early Easter Morning. To her surprise, there I was with my little buddy, a cattle dog. Once she acknowledged me, I immediately hit belly to ground and shook from head to toe. I was so scared. People had not been kind to me and here was another one, getting too close for comfort. Martha sat on the ground to show me she was OK. I was still scared but my little buddy jumped on Mom’s lap and licked her up one side and down the other. Mom called out for Gary to help and her first words were “Can I keep them?” Soon after, Martha asked if she could name me Dollie Mae after Gary’s mother, who was also a beautiful red head with Betty Davis eyes. That’s what she said about me and so far it was sounding good. They fed us and left for the day, expecting us to move on, as we country dogs often do. But no, we weren’t going anywhere. They showed us kindness, respect and something called love that I had never known. And we have been here ever since. In the beginning, I couldn’t control my fear. I even tried to bite a couple of people. I shook a lot and boy did I have indigestion. I ate too fast as the food was too good and more than I had ever had. Do you know someone told them to put me down because I would never make the adjustment? Martha and Gary were very patient, letting me develop in my own time, and develop I have! They tell me I am the most gorgeous, sensitive animal. They say I’m a gift to them and I have taught them to never, ever give up on any living thing. They really love me and no longer are they Martha and Gary — they are my Mom and Dad. Story by Dollie Mae & Martha Abraham. Photo from Martha Abraham & Gary Rawlins. 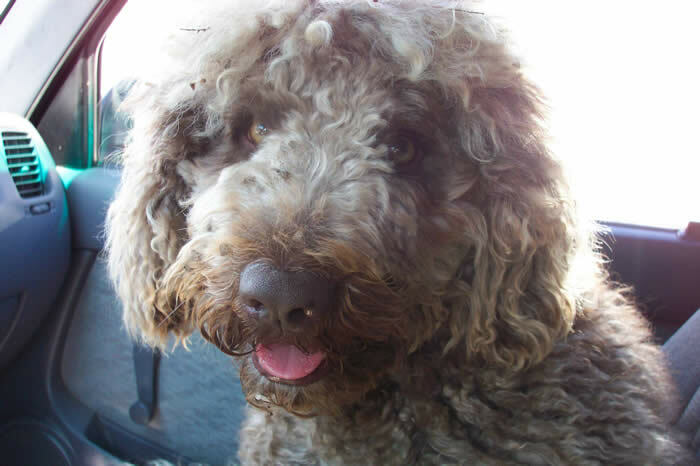 I am a Spanish Water Dog. There are times in your life when serendipity presents itself and you just say, “Thank you”. Well, here is my serendipitous tale! Martha was visiting the vet with her Weimeraner, Henry, when she stumbled across my cute little 6 week old sister Marlie. She was wearing out the owner with questions when the lady explained that my dog parents had come from Spain along with their teenage people to live with their mother in Asheville. So the nice lady got her teenage sons back but she also inherited 2 dogs and 5 puppies in a short amount of time…. Her thought: “Get these dogs outa here!” She then explained that one more puppy was up for grabs. Now Martha was on a mission and came immediately to my house. I took one look at this lady and barked ”Take me! Take me!” She scooped me up and exclaimed “Boy, he is a shoe polish brown chocolate bundle of trouble!” Oh no! Did I overdo the introduction?Martha asked if she could take this little fur ball (me!) out on approval, in the hopes that Gary would fall in love. WHEW! I made it past the first audition. Before we got out of the car, Gary said ”He’s a keeper!” I said…SUCKER! (You see….I know how cute I am) And the rest is history. I joined King Henry and served as Prince of the Bed and Breakfast at Ponder Cove. He taught me everything I needed to know to dazzle guests. Henry is no longer with us to enjoy my antics, but I know he’d be proud. Mom and Dad remind me everyday that I am one special pup and I think I have to admit that I am one lucky pup! Story by Ponder & Martha Abraham. Photo from Martha Abraham & Gary Rawlins. 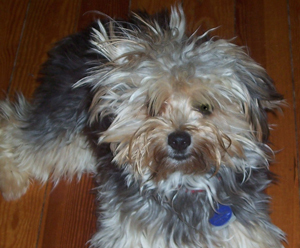 I am a mini-schnauzer, born in a puppy-mill in South Dakota and shipped to New Hampshire. My family found me in a cage in a pet store, waiting for the perfect home. They thought I was cute but TOO high-priced, so they came back to see me four times. When they FINALLY took me home, I was the proudest little schnauzer in the world.I spent my first 18 months in the woods of Maine, where I had loons and egrets and blue herons – and moose and chipmunks and red squirrels – for playmates. All were my best friends. We got Nubbs the cat a few months after we moved to Maine, and we were great buddies during the months the snow was 4 feet deep. I saw almost no other humans – except the people at the harbor general store (where we had breakfast) and the post office. There was a trading post, and I liked to go there and see the two old lobster farmers. With most people, I’m a shy girl. But I’m alpha to the 20 furry feet in my house!When we returned to civilization, I was horrified. WHERE WERE MY LOONS? WHO WAS GOING TO CANOE TO THE TRADING POST EVERY MORNING AND NIGHT? WHAT HAPPENED TO THE LOBSTERS AND SEAGULLS???? I’ve had a rough life…. Story by Strudel & Marlisa Mills. Photo by Marlisa Mills. I was a fox terrier/hound mix (!) about 12 years old – maybe older – when they filmed me. My name is Friday, and I’m always felt like the luckiest dog in the neighborhood. My Mom found me standing in the middle of the road, after I ran away from an owner who rescued me from Yancey County but didn’t really like me. I’m so very grateful to have had a good home. My job in the family is to guard against killer squirrels and make sure all furry critters co-exist in peace and harmony. Just call me NAMASTE PUP! Story by Friday & Marlisa Mills. Photo by Marlisa Mills. I was abandoned as a puppy – at the vet’s, after expensive surgery. My Mom found me at an antique store, where a nice lady took me in. I came home on a “trial” basis – and stayed! Although I was the youngest and newest member of the family, I was loud, tenacious, and very happy. I was a special needs pup, however, with lots of medical issues, and my life was short. But that’s ok – what I lacked in normalcy, I made up for in cuteness and so much fun, and I LOVED my life! … and sometimes I did! Story by Weazie & Marlisa Mills. “Before and After” photos by Marlisa Mills. Little Pearls is an independent non-profit, approved as a 501(c) (3) organization by the IRS in 2004.